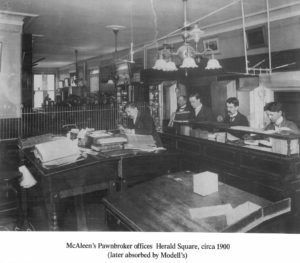 Modell was established in 1893 and has been family owned and operated for four generations. In 2010, Eric Modell was elevated to the role of President, continuing to operate the Modell companies in the same high standards and professional values that have been passed on through the four generations, starting with his great grandfather George, his grandfather Louis, and his father Gerald, who now serves as Chairman. Following in his father’s footsteps, Eric is the current President of the Collateral Loanbrokers Association of New York (CLANY). He was elected to that position in 2010. Gerald had been the President for 25 years. 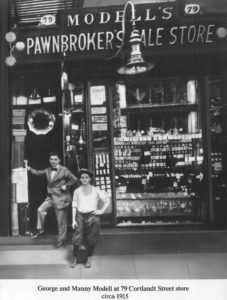 Eric also serves as a Director of the National Pawnbroker’s Association (NPA) since 2005, while Gerald sits on the Board of Trustees of the NPA. Eric also serves as Treasurer on the Board of Governors of the 100 Year Association of New York. Over the years, Modell has extended hundreds of millions of dollars in loans to hundreds of thousands of consumers in the New York City area. Today, Modell has 7 locations in New York City. Our mission is to provide fast, confidential and courteous service when needed by our many clients. 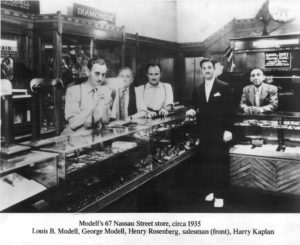 Modell is a member of the Diamond Dealers Club (DDC), Jewelers Board of Trade (JBT), The 100 Year Association of New York, The Collateral Loanbrokers Association of New York and the National Pawnbrokers Association (NPA). You are invited to explore our website and ask any questions concerning procedures, safety, or about our rates, and use our services when you need them. Please feel free to contact us with any questions that you might have.